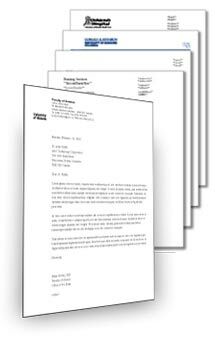 Ideal for letterheads or anything you might want to run through your laser printer or copy machine. Laser safe thermorgraphy is manufactured with a combination of specially formulated thermographic powder and ultraviolet light. This combination "cures" the raise permanently, so that the heat generated by photocopiers and laser printers is not able to remelt the raised image of laser safe thermography as it would do to regular thermography. Please note, that due to the different thermography powder being used, lasersafe thermography has a slightly duller finish than regular thermography and darkens the colour slightly when compared to regular thermography.